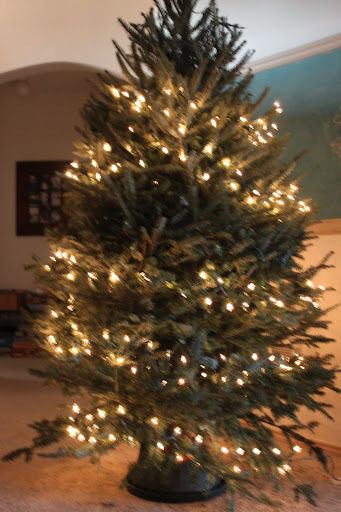 While admittedly behind the norm for me in a holiday season, we finally got the tree up! I have used an artificial tree for much of the last ten years out of convenience and the quality of them has so drastically improved, however, while shopping at Whole Foods (possibly my favorite place in the ENTIRE world) we saw their selection of Frasier firs. If you have never used one but like live trees, I highly recommend them…the smell is superb and they hold ornaments quite well. Whole Foods is supporting a family farm with their effort and you gotta love that. Over the last five years, I have been doing a great deal of simplifying, so for this tree we opted to make a large portion of what would go on the tree. Our one rule that stays the same every year is that things from previous years must be repurposed/reused/recycled. What we don’t use is either passed on to someone else I know that can use them or it is donated to Goodwill for someone to buy them while supporting a great charity. From last year, we kept the background of natural items consisting of grapevine garlands, pine cones, pecan garlands and various pieces of primitives to include rusted star garlands and rusted jingle bells. We also had filler bulbs that are chocolate brown and brown glitter snowflakes so that went on first with the twinkle lights. 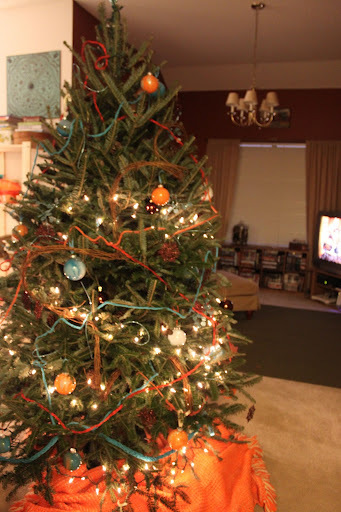 On top of that, we added knitted garlands by middle monkey in turquoise and orange and glass ornaments we got from Michael’s. On these we painted the interiors with blue, orange, white and glitter paint. This is a super easy and cheap way to customize your tree! We added two beaded orange garland we scored at HomeGoods super cheap and constructed a topper from blue beaded picks we found at WalMart. Obviously, these are not item handmade items but they do look like it and add to the over all funky vibe of the tree. Underneath the tree, we added the two orange wool blankets we have collected from thrift stores and Army/Navy supply stores over the years. Normally these spend the year in the baskets for the cats to sleep on but for Christmas they become our tree skirt. Previous to this incarnation, we did a Mardi Gras theme that was a ridiculous number of colors and this orange option underneath is a carry over from then. Though each blanket is different (one is a Danish Army officers blanket, they other knitted by someone and abandoned) it adds to the spirit of repurposing we believe in greatly. Here in our town, we will be able to recycle the tree at a drop point and pick up bags of mulch in exchange from others that did this last year. 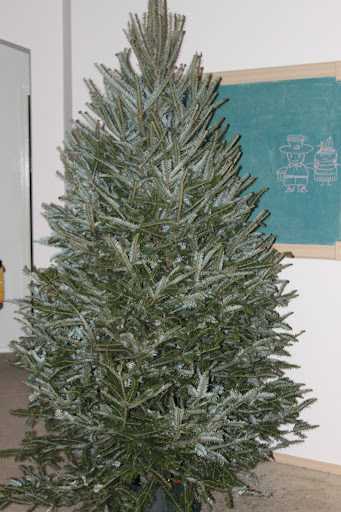 It makes me feel better that buying at Whole Foods, we got a tree from a family farm and it helps me feel like I am contributing directly to someone to keep their business rather than buying something faux from a big box retailer.